I come to fields and vast palaces of memory, where are the treasures of innumerable images of all kinds of objects brought in by sense-perception. Hidden there is whatever we think about …. When I am in this storehouse, I ask that it produce what I want to recall, and immediately certain things come out; some things require a longer search, and have to be drawn out as it were from more recondite receptacles. Some memories pour out to crowd the mind and, when one is searching and asking for something quite different, leap forward into the center as if saying ‘Surely we are what you want?’ With the hand of my heart I chase them away from the face of my memory until what I want is freed of mist and emerges from its hiding places. Other memories come before me on demand with ease and without any confusion in their order. This passage is from Augustine’s chapter on Memory in his Confessions, and to some degree it resonates with our own experience of memory. I suspect, however, that at the same time it may seem as if Augustine’s memory is more expansive than our own and that he has achieved a greater organization and mastery over his memory than what we would claim over ours. And this is probably about right. It is as a Christian that Augustine seeks God in the memory, and as a Christian Platonist, believing that knowledge of the divine is innate in memory. But is not this vast and echoing memory in which the search is conducted that of a trained orator? This may become a well-worn topic around here in coming days, weeks, months, so I’ll apologize in advance for that. At this point, though, I’ll only throw out the observation that in his rather dense, Memory, History, Forgetting , Paul Ricoeur considers various abuses of memory including artificial memory. It is a vast and infinite profundity. Who has plumbed its bottom? This power is that of my mind and is a natural endowment, but I myself cannot grasp the totality of what I am. Is the mind, then, too restricted to compass itself, so that we have to ask what is that element of itself which it fails to grasp? Surely that cannot be external to itself; it must be within the mind. How then can it fail to grasp it? This question moves me to great astonishment. Amazement grips me. This is a remarkable observation of the inability of memory, and the mind more generally, to encompass itself. 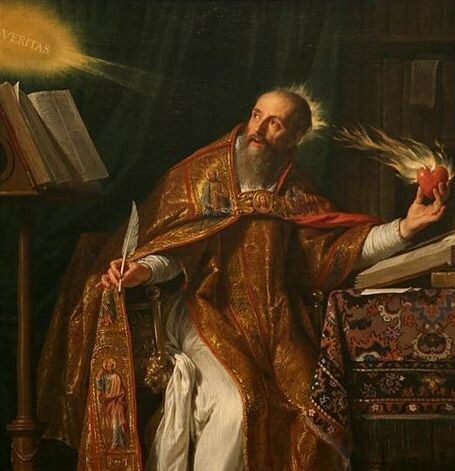 His wonder at the complexity and opaqueness of the “inward man” is one of Augustine’s most significant and enduring contributions to the Western tradition. The recognition that there is an element of itself that the mind fails to grasp, that “the mind knows things it does not know it knows,” predates the Freudian unconscious by a good 1500 years. People are moved to wonder by mountain peaks, by vast waves of the sea, by broad waterfall on rivers, by the all-embracing extent of the ocean, by the revolutions of the stars. But in themselves they are uninterested. A good reminder that the most amazing thing about the universe that contains such wonders may be the creature who is able to contemplate them, be moved by them, and hold them in memory.